I’ve mentioned before how I feel about Resident Evil 5 and 6 – I don’t think they’re awful, just not horror focused games any longer. I decided to go back to the first Resident Evil I had played in a long time, which heralded in all of the repressed memories of terror I had left with my teenage self. 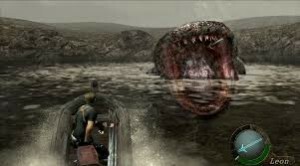 When I first turned on Resident Evil 5, I thought “This doesn’t seem too scary. Maybe playing 4 just gave me tougher skin”. With Resident Evil 6, I thought “This is action but I kind of like it. Tension is pretty good, some of the scenes and moments are awesome. I’m not scared, but oh well”. With those things in mind, I settled in for Resident Evil 4 once again, cocksure and ready. I lied. I was not ready at all. The first few cut scenes occur, I’m giggling about Leon’s ever-cheesy dialogue and one-liners, all seems well. Then, I’m all alone against not-zombies in a dreary, intense atmosphere of little color and numerous ways to die. By the time I reached the village, it had dawned on me how terrified I used to be of this game – and how terrified I was once more. It only took that one scene of Dr. Salvador aka Chainsaw Man busting out after me before I was in total panic-mode. However, once I had survived the situation, I gained an entire new level of respect for the game. The story of Resident Evil 4 seems fairly straightforward on first glance. As straightforward as the president’s daughter being kidnapped by a crazed cult of parasite monsters being helped along by an old comrade or two can be, as it were. 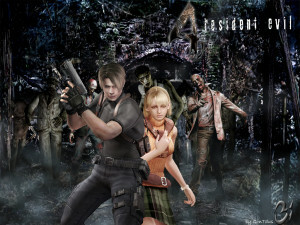 As Leon Scott Kennedy, the man of many one-liners, the player is dropped off into a nameless region of Spanish influence amid hostile locals, chainsaw men, giant monsters and a whining blonde woman. Clearly, he is not getting paid enough, considering they drop him off with a single handgun (thanks Mr. President). Typically alone, with the odds ever-stacking, Leon has to rescue Ashley Graham and get her safely back to her father, as well as other such issues as being infected and whatnot. So, the story sounds about as cheesy as Leon’s casual shrug to the awfulness happening around him constantly, right? Personally, I’ve always leaned more on the side of Resident Evil using a lot of tropes and cliches from horror movies and zombie films especially, rather than the action movie influences apparent in more recent releases. Regardless, the plots have always come across as not to be taken too seriously to me. Here, despite how ridiculous the setup sounds, the story really does pay off in an appreciable manner. Fighting a giant lake-salamander sound dumb? Put into practice, that boss fight is pretty damned unnerving. All the usual little nods and humour are hidden in the game but Resident Evil 4 comes across as the most somber and frightening of its brethren in many ways. Start to finish, the game is tense and even the ending gave me another pause for thought. I won’t spoil it, but the end credits reveal an incredibly sad new light to the Ganados and their relentless assault against Leon. 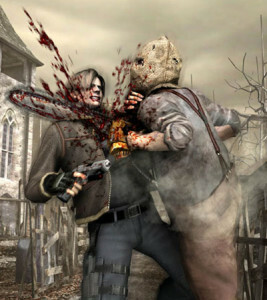 All in all, I’d give it a round of applause for both how ridiculous and astounding Resident Evil 4 pulls off its story. A story that isn’t taking itself entirely seriously but still manages to stir up a vast emotional response is rare. The grim, faded colors of the environment coupled with the quiet of rustling leaves, thunder, and background music that is dread itself had me both impressed and scared. Even having played the game at least a dozen times before and remembering most of the secrets, hidden items, tricks and oddities, I still felt helpless at times. The graphics still look pretty impressive on an HD television. The colour palette helps keep the game stylized and looking fairly crisp. Some games I can’t even go back to without my eyes straining but Resident Evil 4 still holds strong in the visuals. Speaking of visuals, the designs on some of the monsters, especially the boss fights, and certain environments deserves kudos. With the buildings and general environment, everything is presented as decaying, abandoned and just that general uneasy level of ancient a lot of horror mediums take advantage of. Just as well, the monster design takes advantage of the squirming, awful antagonists of the game by taking inspiration from insects and parasites. Eight years after my last playthrough, and I still found myself giving a whimper or two towards certain boss fights. Chief Mendez and “It” are still practically guaranteed laxatives. Adding to the presentation of Resident Evil 4 is its sound design. The background music, the boss music, every single sound and clip from this game, I’m convinced, comes from a demon conductor. It’s near ineffable how anyone got the sound design to pure horror down pat, but each bit of music has this screeching, drawling awfulness to it that perfectly emulates how I feel being forced to face those monsters. The gameplay still felt nice and natural. It might be all of the Melee I play, but the Gamecube controller is one of easy adaptation for me, and playing again took very little time to readjust. Beyond that one advantage, everything still felt smooth and fluid. The combat was responsive most of the time and only faltered when a zombie decided to stumble out of Leon’s kick or knife range. Some of the quicktime events can be a little unfair as well when it comes to response. A bit of memorization tended to bypass that issue most of the time. Shooting also still took a bit of skill and quick reaction. It’s very easy to get overwhelmed or trapped if you don’t think on your feet. Maybe RE5 and 6 spoiled me a bit on that, because in those two, I never felt all that cornered or overwhelmed except once or twice in Leon and Helena’s campaign; how’s that for coincidence? Overall, Resident Evil 4 stands strong and is still one of my favorite games. It got so much right that any issues seem to float right off into the zone of uncaring. It looks good, plays good and scares more than most Resident Evil games, I’d bet. I spent so much time talking about the sequels to Resident Evil 4 in this article, I feel it’s only fair to come back and do Let’s Replays on Resident Evil 5 and 6 as well. Join me next time as I trudge through each with my rose-colored lens smashed. Also, please send help, I haven’t been able to get past this Regenerator in weeks and I’ve run out of limbs to eat.